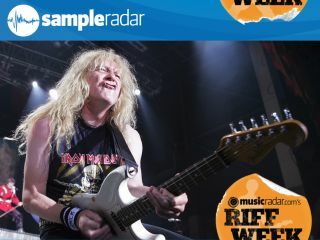 Iron Maiden's Janick Gers strikes a quintessential metal pose. As you've probably noticed, MusicRadar's guitarist fraternity has been celebrating Riff Week over the past five days, picking the greatest riff of all time in the process. But what if you never got round to buying (and learning to play) that first real six-string? Don't worry - SampleRadar is here to meet your riff (and other) requirements, bringing you a mighty collection of royalty-free heavy metal guitar sounds. The samples are split into three folders: Guitar A; Guitar B; and Guitar C. Each of these contains riffs, chugs, power chords and more. All the samples are supplied as 24-bit WAV files so can be imported directly into your DAW or sampler of choice. Because they're royalty-free, you're welcome to use them in your music in any way you like - all we ask is that you don't re-distribute them. The heavy metal samples are supplied in a zip file, so you'll need to extract them before you can see them. Enjoy! These samples originally appeared on Computer Music magazine's cover DVD. Check out the latest issue for many more.